If you ever tried to do social media search using social media platforms, you probably found that the results are often not great. But there are tools that can help. In this post, I’ll introduce you to seven tools that will help you find more detailed and accurate information on social media related to your business or anything else that interests you. Note: most of the tools provide free social media search (some are paid but low cost). When you go to Social Searcher you’ll see a search box similar to the following. When you enter your keywords in Social Searcher, the tool will search all social networks at once and return results for Facebook, Twitter, Google+, Instagram, and Tumblr. You can choose to sort results by Date or Popularity, and also use filters to narrow your search results by Sentiment, Post Types, and Social Networks. Note: they recently added social media name search also so you can search by name. We recently did a post on using Google Advanced Search for Blog Research. It contained a range of Google commands that are used to find content to get ideas for blogging, find guest blog opportunities, and much more. Some of these commands can also be used to search social platforms. Site: you can perform a social media username search if you want by just adding the username (if you know it). This works because Facebook includes the page name as part of the web address. This command can be used with other platforms also. 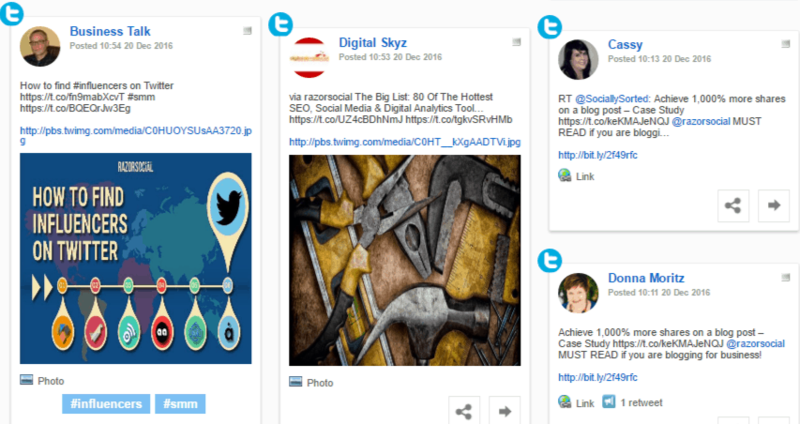 Uvrx social search is a collection of Google custom searches put together for Twitter, LinkedIn, Youtube etc. Google allows you to easily build your own search engine by specifying the list of sites you want to search. The social search engine was built using Google technology and the only requirement from Google is that they display their advertisements. 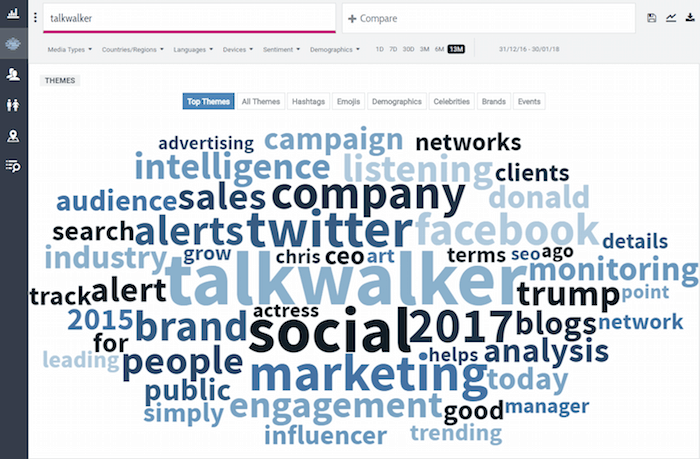 Talkwalker Social Media Search is the most feature-rich tool in this roundup, and it’s completely free to use! To get started with Talkwalker social media search, go to their website and create a free account. The free account will let you perform unlimited searches over the last seven days across Twitter, Instagram, YouTube, blogs, news, forums, etc. You can search by country and media types. If you want to include Facebook results in your search, you’ll need to connect your Facebook account. 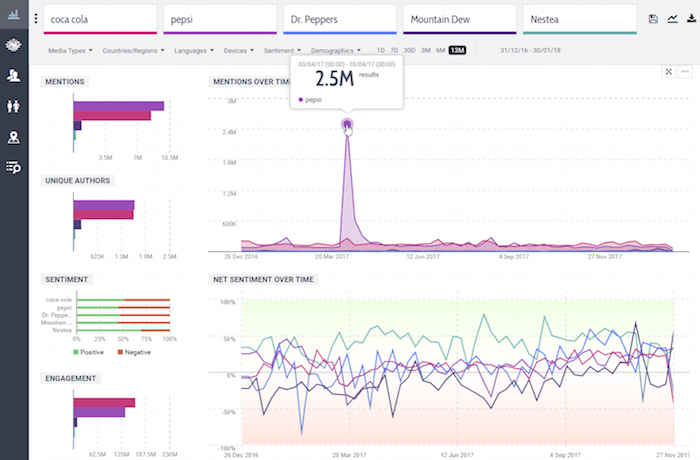 After you enter your keyword, the tool will show you the total number of mentions, sentiment (positive/negative), engagement, reach, demographics, and other useful insights. There is also a timeline chart that shows the results over time. You’ll see your top 100 results in a list similar to the one below. You can change the layout for your results and sort them by engagement, potential reach, date published, etc. If you want to access more data and analytics you can also upgrade to Talkwalker Quick Search. This gives you 13 months of data (vs 7 days), up to 5 topics to compare (vs 0), easy influencer identification, demographic data and greater ability to understand the context of social discussions. It’s a great tool for people that need to prepare pitches for multiple prospects and have more needs for market research and campaign analysis. The layout is the same as Quick Search so it’s as easy to use, just a lot more powerful. 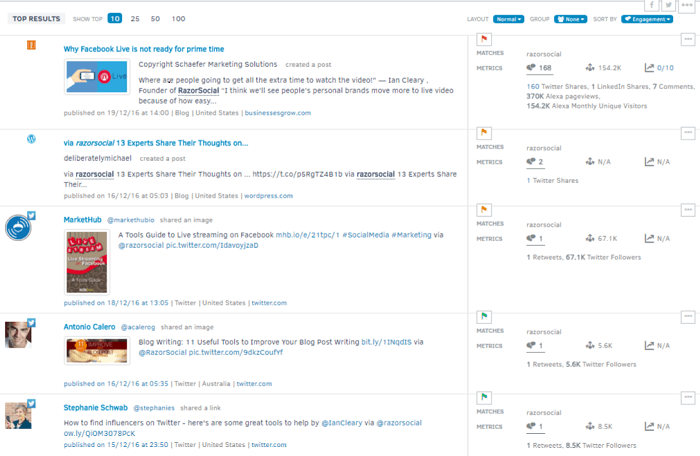 Here’s another screen which allows you to compare mentions and sentiment over time. Tagboard lets you perform a social media search, for all social media networks at once, for hashtags from Twitter, Facebook, Google+, Instagram, and Vine, giving you a complete picture of what people are saying around a hashtag you are interested in. The results are displayed in a user-friendly dashboard and you can filter them by a social network. Another great feature of this tool is the ability to save a particular tagboard that you’re interested in. 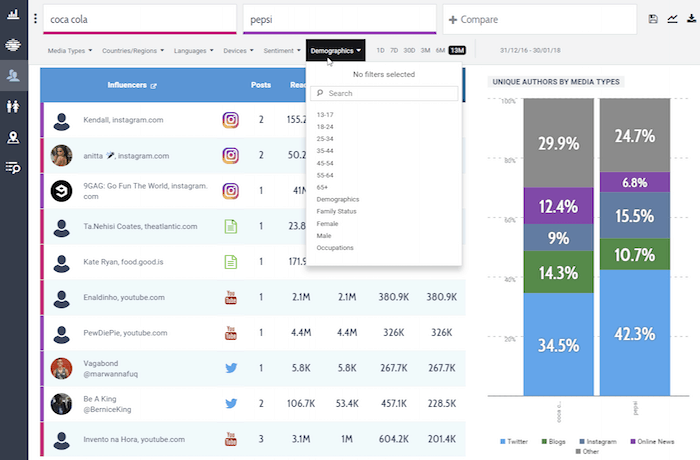 AgoraPulse is a comprehensive social media management platform that, among other things, offers some really good tools for searching social media. Well, it’s more about ‘listening’ and then searching through the most relevant content and conversations that AgoraPulse finds for you based on the keywords, hashtags or usernames you specified. 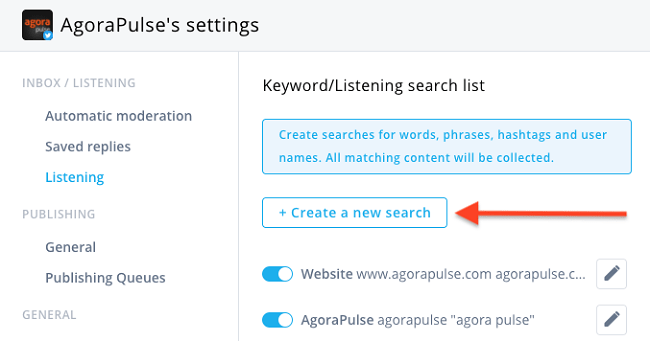 So, instead of searching around different social media sites to find out what people are saying about your brand, your product, or topics related to your industry, you can set up searches for relevant keywords in AgoraPulse and track them across different social networks. Monitor hashtags and locations on Instagram. Another useful feature is content tagging – you can tag important content so you can easily find it when you need it. With Brand24, you can monitor major social media platforms as well as blogs, forums, and other sites for mentions of your brand, product, key topics, or competitors. In addition to delivering real-time information about your mentions, the tool analyzes your social media interactions, sentiment, and more. Brand24 also recently introduced the Locations feature which allows you to filter mentions by country. This is very helpful if you are running a marketing campaign in a specific country and you want to analyze mentions for that location. 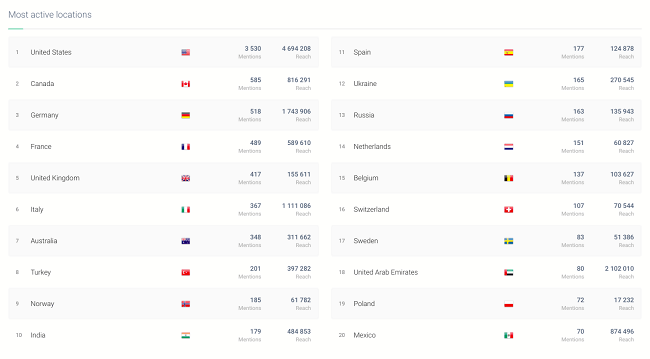 You can also see which countries generated the biggest number of mentions. What I found quite useful is that you can see the influencer score for each of the mentions so you can prioritize which mentions to take action on first. Brand24 is an easy-to-use tool that delivers very comprehensive monitoring features and it’s well worth checking out. Learn more about How to Use Brand24 for Monitoring. These are just some of the tools I use for free social media search and some I use for paid! Note: Facebook search tools are limited because of the limitations that Facebook impost.